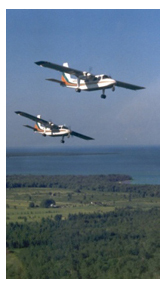 For more than 70 years we have been both Charlevoix and Beaver Island's committed aviation service provider. At Island Airways, you are more than just a passenger, you are part of our family. Our operation is based in the main Airport Terminal located on the Charlevoix Airport. With our friendly staff and our history of safe, comfortable, and competitively priced flights, we're ready to serve all your aviation needs. We offer charter flights to a multitude of locations in the United States, as well as freight and passenger services to Beaver Island and Charlevoix. We are also the certified carrier of the U.S. Mail, UPS, and FedEx. In addition, we are certified to ship hazardous Materials (HAZMAT) to Beaver Island. Our Beaver Island-Welke airport services include maintenance, free wireless internet, rental cars, and much more. We are here to accommodate all of your aviation needs!